The best Keurigs for office use will depend on the size of your company and your budget, mostly. There are other features that make one Keurig stand out above the rest, too, though. Some are obvious; others are things the average customer wouldn’t think about right off the bat. Why Use a Keurig in the Office at All? K140 series is best for small offices with few employees. It’s pretty basic and the only special feature it has is automatic shutoff. K150 series is best for small to medium businesses with only a few employees. Though it’s not much better at serving large crowds, it does have extra features that the K140 series doesn’t offer, like an available direct water line, adjustable temperature, automatic shutoff, and programmability. K500 2.0 series is good for small to medium offices. You’ll need to be careful about the K-Cups you buy for this one, so that’s worth keeping in mind when you make your decision. These come with a lot of extra features that make it fun and intuitive to use. K3000SE is best for larger offices with more employees. This one’s a superstar. It offers the available direct water line, adjustable temperature, and it’s programmable. However, it does not have the automatic on/off option. Eccellenza Touch is good for large businesses and has a touchscreen that allows employees to make their choice of 60 specialty beverages. It goes into standby on nights and weekends. 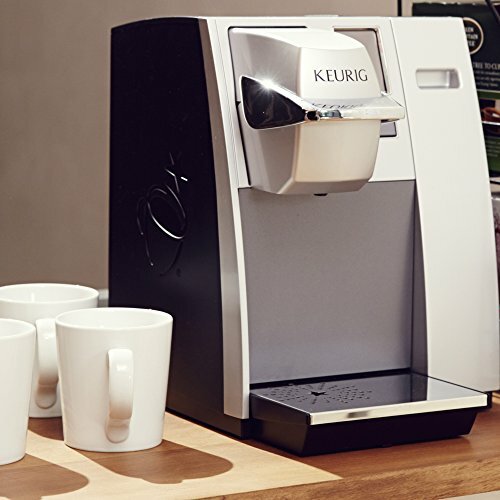 It’s designed to cut down on maintenance stress, has two bean dispensers and three powder dispensers, should be maintenance-free for either a year or 10,000 cups (whichever comes first), and it connects to Wi-Fi to monitor supplies and maintenance needs. 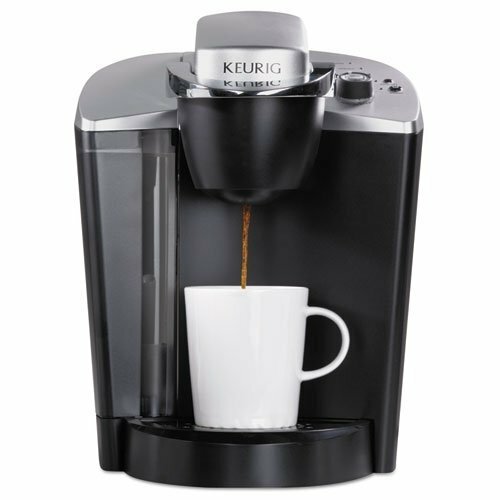 You might be surprised to find that there’s not a long list of the best Keurigs for office use. What it all boils down to, though, is features that serve an office environment well and the size of the water reservoir. Here are a few of the best, with tips on choosing which one’s best for your office. The Keurig OfficePRO K145 is a solid pick for a small office because of its 48 oz water reservoir and ability to make three different cup sizes. The materials used in the OfficePRO model are sturdier than those used in the home model and therefore suited to higher volume use than the ones you may have in your own kitchen. It’s easy to clean and turns itself off after two hours, so if all the employees go home and forget to turn off the machine, it’ll turn itself off at the end of the day. If everyone in your office tends to get their coffee by 10:00, it won’t stay on all day. For an afternoon cup (or several cups), it’s easy to turn back on to conquer to midday slump. Then it’ll turn itself back off after everyone’s gone home. You can usually get this one for under $150.00, too, so if the office budget it fairly tight, it won’t break you. This one might be a great choice for small start-ups with a small budget but a desire to do little things to make the workplace a little nicer for their handful of employees. The K155 Office Pro is sleek in appearance and comes with a user-friendly touchscreen and 90 oz water reservoir, so it’s good for offices that have a few more employees. Users will get to choose from four different cup sizes instead of just three, which means people can make their coffee as strong or weak as they prefer. Since this model is made for commercial use, it comes with a feature that Keurigs designed for home use don’t easy drainage of the internal hot water tank. This makes it easier to move and store. You can control the temperature and even change the display language to English, Spanish, or French. It also comes with the auto on/off feature. It’ll cost a little more, but it’s to be expected since it’s got more bells and whistles than the K145. Expect to pay around $200.00 (probably a little over). The price of the K575 model falls somewhere between the other two, at around $180.00. It holds 80 ounces of water, which is less than the K155 model holds and a good bit more than the K145 does. This one reads the lids of the K-cups and K-carafes so the drinks turn out just right. Yep, you read that right: K-carafes. If a couple of employees can agree on a coffee to brew in the carafe, that’s an option with this one. Of course, you’ll have to have a fairly small office or multiple Keurigs to take full advantage of this option since it only makes four cups at a time. There’s even an auto brew option, so you can set it up the night before and have it ready at the start of the workday. It’s always nice to have one less thing on the morning to-do list, right? The water reservoir lid is easy to fill. You can control the strength of the coffee via a setting (so not just the cup size). Mochas, lattes, and hot chocolates have their own settings, and you can always get hot water on demand to make the tea of your choice. It’s a great machine that can easily fit almost everyone’s needs, as long as your company isn’t huge (and in that case, you might just be able to purchase more than one Keurig to keep everyone happy). The K525 model has a lot in common with the K575 and the platinum finish will look sleek on any office countertop. The 80 oz water reservoir makes it easy to make a few cups of coffee before needing to refill it and the extra-large color touchscreen means it’s a user-friendly option. Choose from 10 cup sizes between four and 18 oz, as well as 22, 26, or 30 oz carafes. Control the strength of the coffee as well as the temperature. Adjust settings with ease, including auto brew, energy saving mode, and more. Want a mocha, chai, or hot chocolate? There are special settings for those, so your employees can have the drink they want, made just right. The 2.0 models read the lids on the K-cups (coffee included) to make the drink the way it’s meant to be enjoyed. When you buy a 2.0 model, though, keep in mind you’ll need to purchase only Keurig Brewed cups. If you don’t want to be committed to those types of cups, you may want to consider Keurigs that are not part of the 2.0 lineup. There’s a way around that limitation, according to a quick Google search, but it’s probably not something you’d want to do in an office setting anyway. 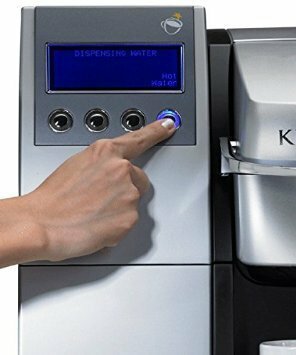 The K3000SE is another commercial grade model from Keurig, so it’s one of the better ones for offices with more than just a few employees. This one is especially nice because it has direct water line plumbing so you can brew back-to-back cups with no trouble at all. It was actually created with large businesses in mind. There’s also automatic K-Cup pod ejection. There’s a disposal bin built right in, so employees can grab their cup of delicious productivity and go without worrying about cleaning up. The true coffee fiends in your workplace will love it because they can even flip the drip tray up and fill up a tall mug. They won’t be limited to 12 oz mugs. The touchscreen makes everything easier. Select your language and cup size right there on the screen and wait for the coffee to brew. That’s it. The temperature is also adjustable, as it is on several models. If you’re looking for a model that’s compatible with a coin mechanism, this is it. 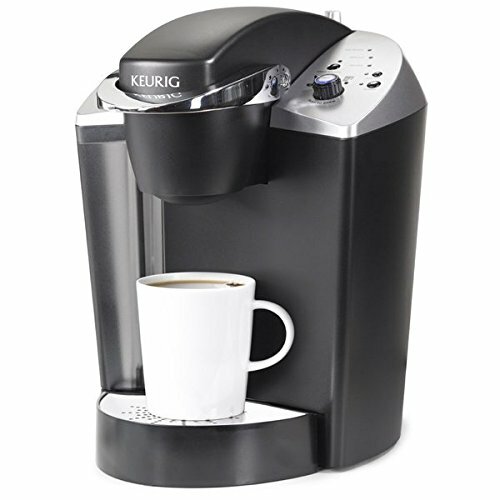 As you can probably guess, this is the most expensive Keurig for office use on the list so far. Expect to pay at least $500.00 for it (often more). Shop around online before making a purchase because there seems to be a big price range, and online prices are always changing. 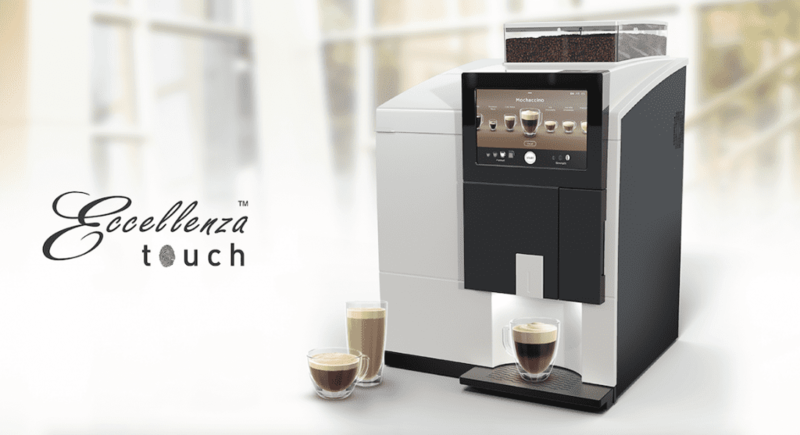 The Eccellenza Touch is the absolute top of the line as far as Keurigs for office use is concerned. You won’t be able to buy this one from just any store. 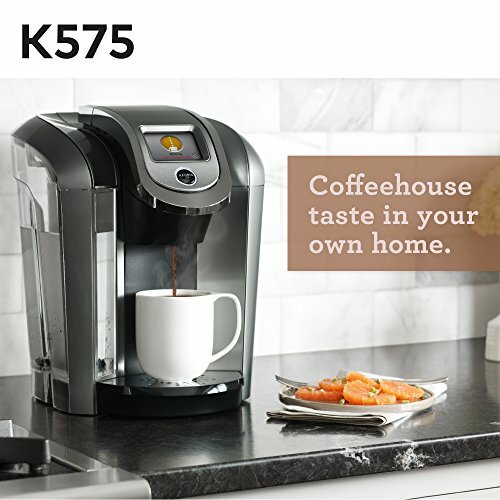 Instead, you’ll need to visit the Keurig website to find out more about making a purchase. Expect to pay more than $6000.00 for this one. It has the smallest footprint. It lets users choose between three cup sizes and three strengths. There are two bean dispensers and three powder dispensers. Wi-Fi monitoring takes the worry about restocking supplies or keeping up with machine maintenance off your plate. It’s smart and offers auto-diagnostics, so you don’t have to wonder what’s wrong with the machine if something goes awry; it’ll usually just let you know. It can handle the coffee demands of a large business and make specialty drinks. The touchscreen is a whopping 10.1”. 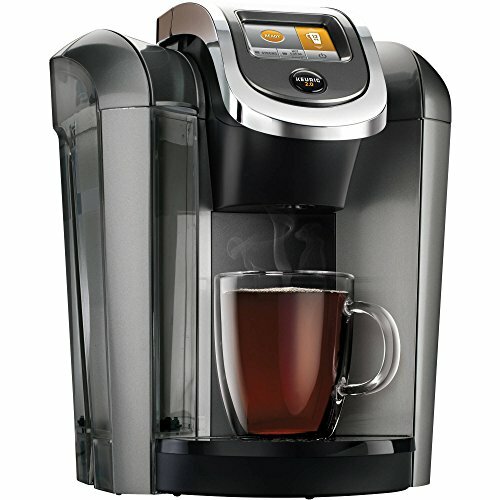 Keurigs allow each employee to make the coffee or tea they like. They can even make hot chocolate or a mocha if that’s what they’re craving. Giving employees control over the strength and roast of their coffee and letting them choose which type of drink they want could encourage more productivity and a more positive view of the workplace. A single bag of coffee in a traditional coffee maker won’t fit everyone’s taste and choosing one (especially if you try to rotate through different roasts and brands to keep your employees happy) can be stressful and time-consuming. And that still doesn’t take into account the people who just want tea or to make their own brand of instant coffee they brought from home. A Keurig allows you to buy tea or hot chocolate in K-Cup form. You can send hot water straight into a mug to make tea (with teabags), instant coffee, or hot chocolate.